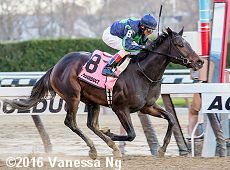 Note: Mo Town broke his maiden in his second start then went on to win the Remsen Stakes (G2) at Aqueduct. He made his 2017 debut in the Risen Star Stakes at the Fair Grounds where he finished 5th as the heavy favorite. He shipped up to Aqueduct where he disappointed in 7th in the Wood Memorial (G2).